Stevan Ridley could make his long-awaited return against his former team this week. When the New York Jets pay the New England Patriots a visit on Sunday, first place in the AFC East will be on the line. Additionally, the Jets could have a former Patriot ready to go just in time for the divisional matchup. 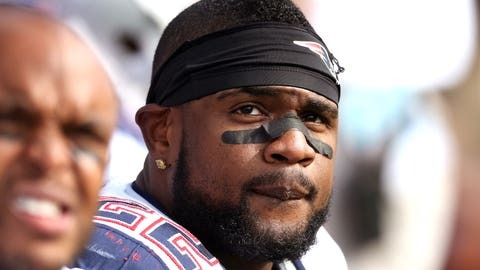 Stevan Ridley began the season on the PUP list, which sidelined him for the first six weeks of the season. Ridley is eligible to return to practice this week and could be active for Sunday's game in Foxboro. “I’m hoping to get him in pads and get him out there and let him run around,” Jets head coach Todd Bowles said via the New York Post. Ridley hasn't practiced in months, so expecting him to play isn't completely unrealistic, but it's not exactly likely. If he is able to go, he'll allow the Jets to keep Chris Ivory fresh. Ivory has been a workhorse back this season, and though he's missed one game, he's been relatively healthy thus far. That's not to say he couldn't use a break, of course. The Jets will need Ivory for the long haul, and Ridley's return could be the key in allowing that to happen.